I did some testing with PWM fan control using the Adafruit Proximity Sensor to control the speed of the fan. I also did some sand fall testing as well with a cardboard prototype, some of which was laser cut. I did some more work planning out my ideas for the sand mirror. At this point, I am only going to build a 1 x 6 vertical grid of fans and have a simple interaction to trigger a series of fan events, whether that be timed delays between each fan starting up or a system of valves opening to allow air to pass down a tube. Hopefully play testing will reveal how well simply a lone fan behind the sand wall might work, in which case, I could put a joystick in front of it for folks to interact with. Below you will see the system diagram. I plan on using a ULN2003 to control the 30 mm fans. For the bill of materials, the fans are going to be the most costly by far, relative to any of the other materials. 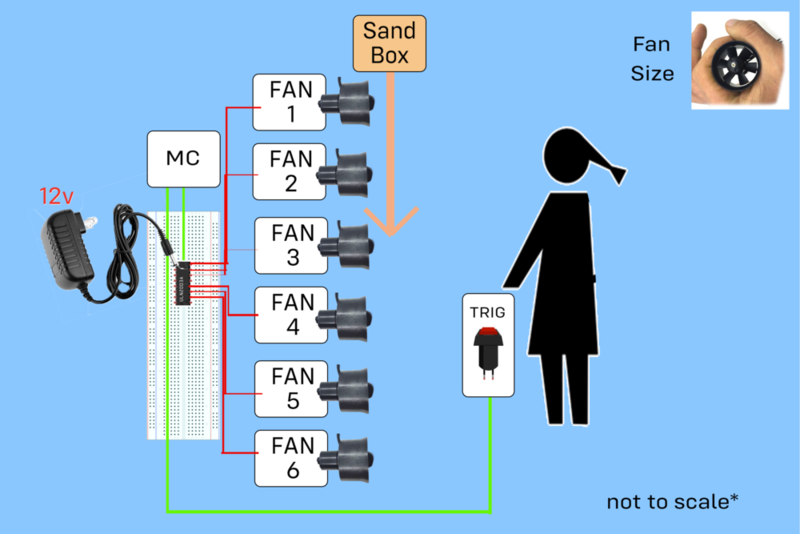 For this reason, I am hoping play-testing may reveal that using one powerful fan that say, rotates in the X and Y axis behind the sand, might be an alternative to the 6 fans. Here is my current to do list and my thoughts and unsolved mysteries thus far. accelerating and decelerating the fan quickly to get the desired responsiveness - 3D print valves? I should add that I bought a 50lb bag of from Home Depot cause that was the smallest amount on offer. I did some initial testing and found that a computer fan was much too small, unless there was very little sand being used. I found a larger size 6” personal fan that seemed to work better, although the wind pattern was not very accurate. I held a smaller bucket of sand over this fan and saw that the fan was effective. However, the sand had quite a bit of dust coming off of it. I described the situation to my roommate and he recommended that I wash the sand. Foolishly, I acted like I knew how to go about that and devised my own way which involved a large piece of fabric, about the size of a shower curtain, that I got from the Soft Lab scraps and the utility sink in the shop. It took about two hours to do all 50lbs which was probably overkill, but I was already at it so why not? I would like to make a low resolution mirror using sand and air. There will be a container of sand above an X/Y grid of holes. From a long slot opening downward from the bottom of the container, the sand will fall in front of the holes which push and pull small currents of air in and out. By moving the sand in the Z space as it falls downward, the mirror will give the impression of a 3-D image moving. One particular feature is that sand will constantly be flowing downward, giving the illusion of an image that is “alive”. This could also be done with some piece of thin fabric as in this video. Another option I found besides programmable air is using fans like these. This way, I would not have to worry about the programmable air and its noisy system and I could make a network of fans. Computer fans also come to mind. They are usually slow, cheap, and I can flip the phase of the power to have them flow in the opposite direction. So that is a better sounding option to me. Below is a drawing of what I have so far. So we’re gonna make ol’ Betty come to life. She’s a librarian now and a pretty cranky one too. Used to work as a crossing guard in my neighborhood, but the sun became too much for her as she got up in age, and the standing all day. But boy did she wave a mean finger in her time, served with an extra of grimace - ooh wee! She tried to find other work which would let her keep her whistle, of which everyone knew she was so fond, but, alas - she wasn’t in shape enough to be a referee; much too old to be a poilce officer; never played sports a day in her life (so coaching was out) - a lifeguard perhaps?? Lord knows ol’ Betty would sink like a rock before saving anyone else, let alone herself! So when Betty got the gig at the local library, she retired her beloved whistle and traded it in for a hearty “Shhhh!!!”. It was a good fit in retrospect, but at the time she recalls feeling like one of those old, disgraced sheriffs in the Old West, turning in their badge as they got relieved of duty. “At least she didn’t end up with a hole in the head!” she thought. But despite the peaceful hours floating by in the library, out of the hot sun and in the AC provided by the taxpayers of area code 11238, Betty developed a blistering case of Type 2 Diabetes, most unfortunately causing her to have to have both her legs and arms amputated. Sad to say, I know, but damned if she didn’t love her Kit Kats and Tab and wasn’t going to let any “medical” doctor tell her what to do. Stubborn old bird she was, stubborn as hell. So off the appendages came and pretty soon there was nothing left but her head, given that the cancer had eaten her to the bone… Oh! Did I forget to mention that she smoked a lot too? I did, I did! My word did she smoke!! Loved those cigarettes, but unlike most smokers', who had a preferred brand that they stuck to for their whole and often much-shortened lives, Betty would smoke damn-near anything she could find. And she was so cheap you know, she had a habit of taking butts straight out of the ash trays you’d find in most public places, of which the library was one of course. So she was like a pig in u-kno-what. Hell, most times people would wait around for minutes at a time wondering where Betty had gone off too until the smoke cleared and you could just make her figure out again. Never coughed once in her life though, peculiar as that sounds. You can try to add that up yourself I guess! Goodness me retirement sure was tough for Betty it seems. But now, luckily, with technology pioneered by the great Ray Kurzweil, Betty has been able to port her brain, via a special USB Z adapter (MSRP $2,399), onto a tiny microprocessing chip - hey folks said she was a lot of things but bright was not one of them - with just enough functionality to minimally perform her duties as an assistant librarian. Don’t you worry one bit though about the Dewey Decimal system giving her any trouble. No fancy text recognition software or motorized appendages (as of yet at least). No, the entire contents of the local library where Betty works now consists of half a half-dozen PC’s and a couple of Reagan-era VHS tapes. Design-wise, Betty will be outfitted with a microphone for ears, an LED strip in the shape of a frown face to be her mouth, an mp3 shield to play a number of different “SHHHshhhh! !” sounds out of a small speaker, which is apropos, given that the throat cancer clear ate up most all of her vocal cords, while still retaining some musicality to her repertoire given the multiple samples. And although she no longer has any eyes, she will have LED placeholders so the children don’t stare too long and bump into a wall or something. One day it would be nice for her to have a wheel chair with which she could follow you around the library with, especially in the case of trouble makers, but we may still have much to dream! Here’s to Betty’s surgery - hoping it goes well! Pot controlling Neo Pixels LEDs. I wasn’t quite happy in the end with my programming for the LEDs. There is an insane string of IF statements that should be turned into a FOR loop somehow, but my brain was too fried from looking for mp3 shield libraries to work it out. This was helpful because it gives a library of note names for each frequency value in tone and also shows a way to make divisions of the beat per each value in the array. And also, you just make the file yourself and reference it using pitch.h instead of a library. This was a helpful feature to learn. I modified the code to play the first few notes of Claire De Lune. The code for the patch is below and the link to the pitch.h file is in the tutorial above. // to calculate the note duration, take one second divided by the note type. For this project, I borrowed a force sense from a class mate and sought to use it to control pitch. Once I had the sensor’s values mapped to a variable within the audible range, I decided to test out my circuit by making a sequence of notes played out of a speaker. For this, I used the tone function with the variable as my frequency and then multiplied that fundamental frequency by multiples of 1.06 to get other note values, as I new that one half step on a keyboard is 6% higher in frequency than the previous note. So (1.06*2) is a second, (1.06*3) is a third, and so on. To get a sequence of notes, one played after the other, I used the delay function in even intervals. So then when I pressed the force sensor, I was able to move the overall pitch of the sequence up together as it cycled through. Here is videos of each step and the final code is for the sequence. Willie: So when thinking how easy an object is to use, I think of how high the bar for understanding its basic function is and how easy it is to make the object to function as intended. The interactive installation in the ITP lobby. Thomas: Yea! So the installation in the ITP lobby as one example (I took a video of it here). For this piece, there really is no interactive role except that you just walk up to it. It functions like a mirror which is a familiar object and sight is a primal and basic sense. So the user understands the piece right away. However, the effect is exaggerated when reproduced from a camera, which provides a lower resolution framework for viewing the effect (see the video). Willie: Yea, so cool in the way that the piece itself is a lower resolution reproduction of reality and you get a better view of it by lowering the resolution! Haha! Thomas: So some things we just know how to work. Thomas: Yea! Just reach out and turn. Although perhaps this isn’t the best example, since I’ve not walked into businesses, thinking the door was locked, when I just needed to push instead of pull..
Thomas: I see what you’re thinking here.. Hammers definitely make a lot of sense when you pick it up, basic function, lots of payoff and utility - although watch out! Cause if you screw it up, there could be some sore thumbs to pay! Willie: True true! [winces] .. Ok what about a cup! Thomas: Ah, yes, well you pick it up, turn it over, and the contents pour out. Pretty easy. Pretty simple. You do it everyday with no problem. You know what a cup is, and it can really serve no other basic function. But! This is not without much training - remember when you were a kid?! Everything’s hard when you’ve never done it before. Willie: Ok, but are these things hard for a child because physically their motor skills and muscles are weaker in comparison or is it really a matter of the fact that the skill is brand new and they have no other frame of reference to go off of? Thomas: Ok think about giving an adult of say, age 35, drink for a glass of water for the first time. Even though they would have a fully developed muscular system, they would most certainly end up with a wet t-shirt and maybe even drop the glass completely, given the novelty of this event and at being confronted with an event so shocking as that, given that they had no grasp of the consequences of their actions. Wille: Still, they would pick it up faster because they have had a lifetime of handling objects with fine motor skills, like writing, handling the car keys, typing on keyboards, etc. Thomas: Point taken. And that is where I was going with this. What kinds of designs can we have that use skills that we already posses or are close enough so we can adapt them for other purposes. Thomas: I like the example of a child on an iPad. One of the first things we learn early on in life is how to point and of course to touch something we see and push it over. So an iPad or iPhone touch screen (point and drag) is an extremely intuitive design, as illustrated by child’s ability to operate simple games with relative ease. Willie: So why can’t grandma work it?! Thomas: Well that’s another story ha! Thomas: Oh wow, another great design! Kind of like the previous example, except this takes almost no effort whatsoever. It’s purely visual. Thomas: In this case, we don’t even have to move - the subway takes care of that for us! Willie: Ok, so what about something more complex. What is something you have thought to design that would take some learning or was maybe too complex to design? Thomas: One design of my own that I had in mind after one of our first PCOMP readings about hands was a hand-held keyboard design where in each hand was a form-fitted grip, almost like egg-like in shape. The user would click with each of the five fingers on a small, round, mouse-like button in certain combinations to produce the letters and symbols on the basic keyboard. You could liken the mechanism to that of learning the recorder in band class as a youth. Willie: Oh Lord, I was terrible at that! Willie: Ok, I see what you’re going for here, but don’t we already have a keyboard that seems to work just fine? Thomas: Yea, no pun intended! A combination lock that opens after 4 button presses. For the next PCOMP lab, I made a combination lock that would “open” (light a green LED) after the button was pressed four times. This was not that hard to set up on the bread board as much as getting the programming right. The logic and syntax was pretty new to me, but Jeff was kind enough to offer just enough advice to let me figure it out. The big revelation was using currentButtonState and previousButtonState as a way to track the state of the button, mainly if the state had changed at any moment since the loop restarted ( previousButtonState = currentButtonState; ). This gave the loop a sense of incremental time so that the number of button presses (or state changes) could be counted by incrementing the pressCount variable inside of an IF statement. When I came back, I decided to at least make something so I was going to make a version of what most folks were up to with the copper tape. It would be a switch that doubled as a bookmark. When the book was open, the switch would not connect, and this would trigger a light to come on and when the book was closed, the light would turn off. This too would take some programming I realized, so I thought to leave the programming for later and at least get the switch done. But it turns out there were all out in the shop! As I walked back to make a cup of tea, I saw the empty peanut butter jars and the idea occurred to use the aluminum from the fresh seal on the top of the jar. I could fold it onto itself and see if I could get it to conduct. I grabbed a few for testing and found here was a thin plastic coating on one side and a thicker paper coating that had been glued on to the other side. I did some testing and found the small aluminum layer material to be conductive indeed so I used an Exacto knife to removed the paper layer, revealing the aluminum in two spots on each side. I then removed a strip of aluminum running down the middle so that I had two pieces, but left the paper layer in tact so it would still fold. I did one test using solder to attach the wires, but I found the aluminum to be terribly difficult to solder on to. I decided to weave the wire through the layers a few times, poking some holes along the way, which worked out ok.
Then the switch was having trouble lighting once it was in the book because of the thickness of the wires holding the pages apart, so I taped some tabs onto the back of the exposed aluminum and the contact was made rather well. The bookmark idea is still in tact, but I’ll need to do learn some programming first!